Welcome to my Sunday Selections. I can't say this will be a regular thing, my camera has been gathering dust in a drawer, I haven't felt much like going out and taking photos, but I was looking through some really old stuff looking for a particular photo, which of course I couldn't find :( and thought you might like to see a bit of my past. After having to sell a house for the second time, (same reason as having to sell the first one), we moved back into renting and found an enormous house with room for everybody, 6 of us, plus a son-in-law to be and a baby grand daughter. 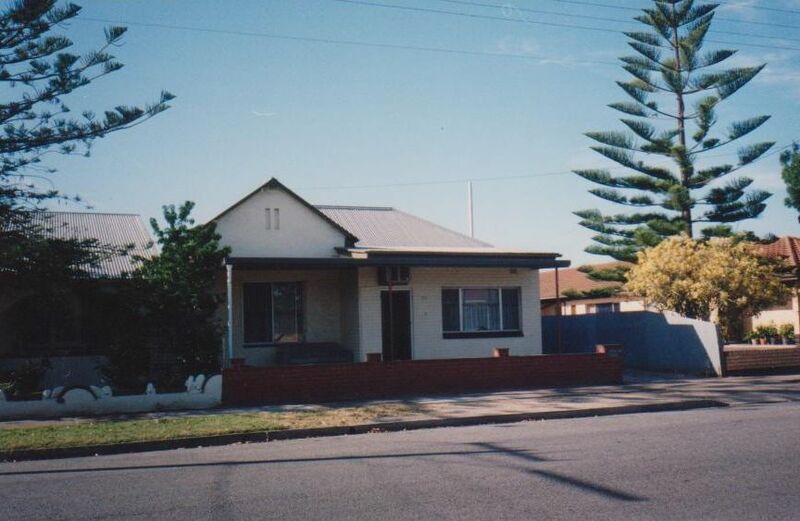 this is the front of the house which may look smallish, but that's distance, I was across the street with an old film style camera. this is the driveway side, taken about halfway down. The shed at the end was the owner's garage, (locked with some of his possessions in it) and beyond that was a huge garden. 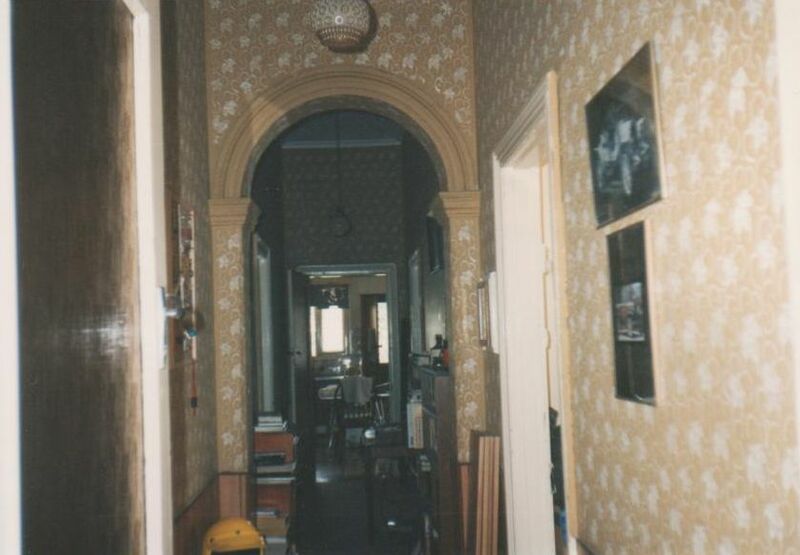 this is the hallway leading down to the kitchen. See all the vine leaves on the walls? 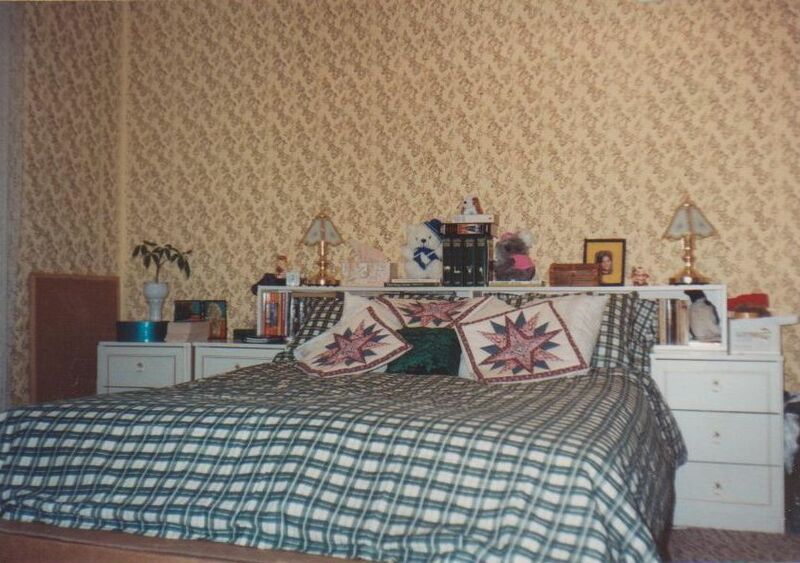 That's not wallpaper, it is hand painted stencils and it was in almost every room, in differing colours. 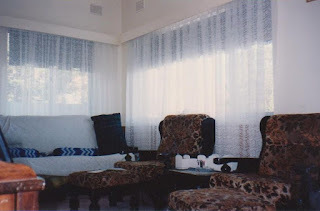 this was my (stencilled but not vine leaves), bedroom, at the front of the house in what was probably the original living room, with double doors, with glass panes that I put curtains on to for privacy. the business side of the kitchen, messy of course. 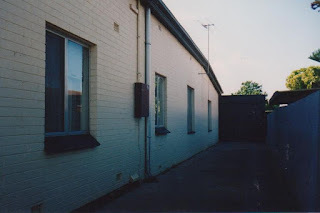 There was a lot of family life happening here, with working adults and four teenagers, three of whom were also working and the soon to be son-in-law, also working. 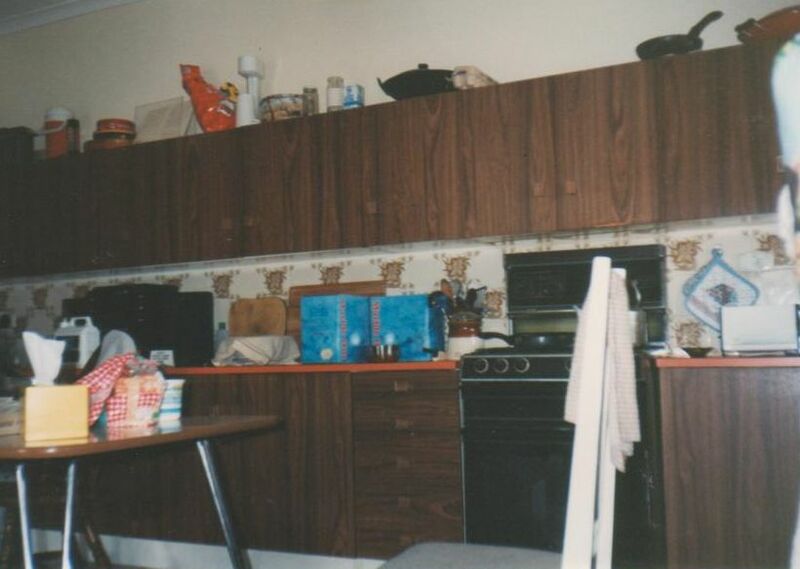 I hated those brown veneer cabinets, but there were plenty of them, about 500% more storage than I have now. the other side of the kitchen had a dining room, separated by the arch you see here, with the fridge in the kitchen and the matching freezer in the dining room, because there just wasn't room to have them side by side in the kitchen. 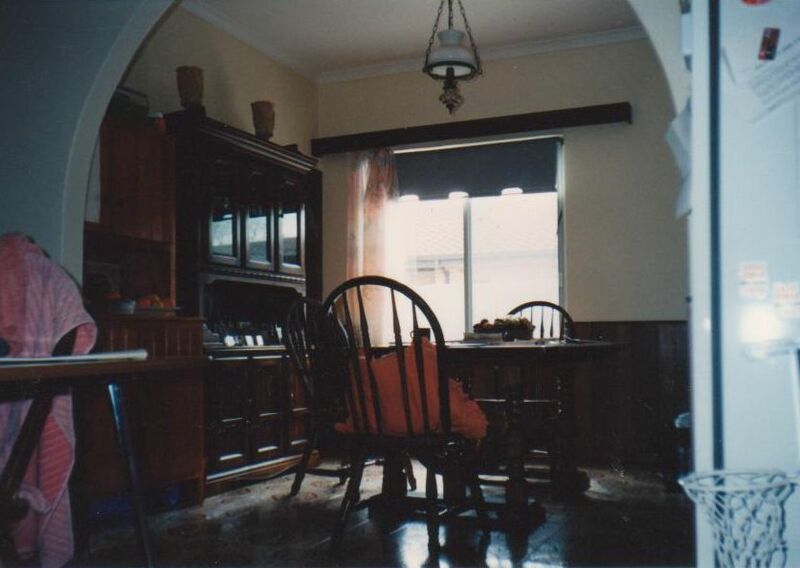 the dining room, with our enormous extension table that measured about seven feet long when fully extended, although I remember having it that way only once. The matching buffet and hutch on the left there survived several house moves without a single scratch. I miss those pieces of furniture quite a lot. the front room, which is a closed in section that used to be a front porch. 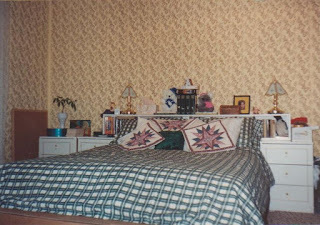 Hubby and I were living "separately" by then, I had the bedroom and the rest of the house, he spent 99% of his time in here when he wasn't at work or other places. You can see he had the good furniture in there, since all the other rooms became bedrooms. 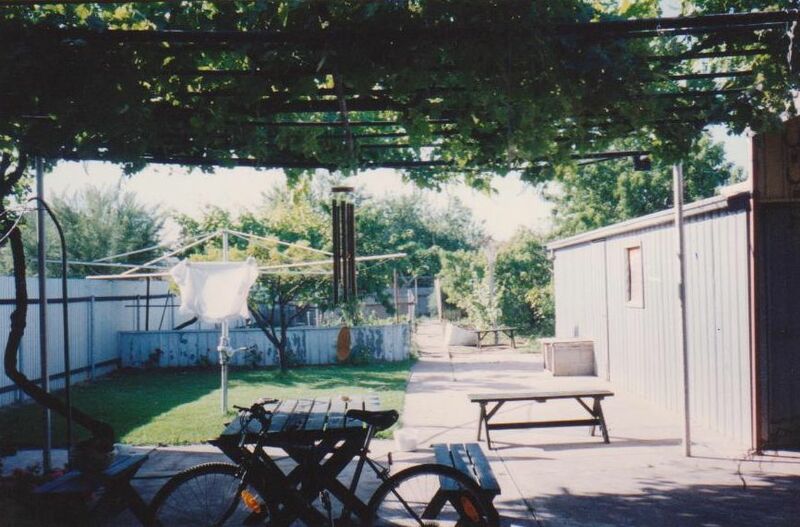 the back 'porch' right outside the kitchen had a huge grapevine with sweet sultana grapes. The yellow box structure you see there is a concrete base that used to hold a rainwater tank, long gone by the time we moved in. Just back from that was the laundry, part of the house, but with a lower roof, which we used to climb onto to watch the fireworks back in the days when "Skyshow" was still an annual event. the only section of (uncut) lawn we had was there too, with the washing line and a mandarin tree. This is me coming in to get a second load for hanging out. looking from the kitchen door aaaall the way back to the fence you can just see if you squint. Maybe. That tiny grey rectangle almost dead centre. 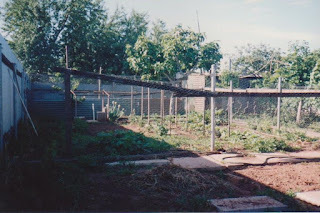 and the opposite photo: I was standing at that back fence, inside what used to be a chicken run, with the roosting/laying shed on the left behind the wire that is holding up an impressive stand of asparagus. 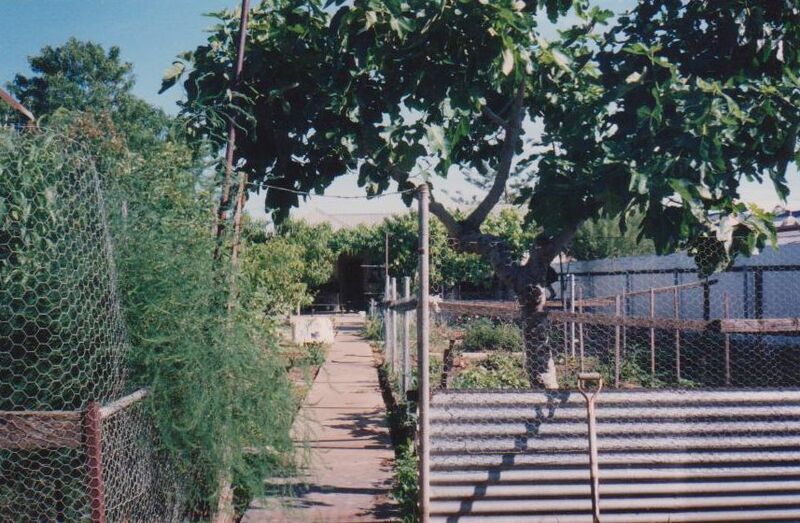 On the right, just outside the chook run was a huge fig tree. 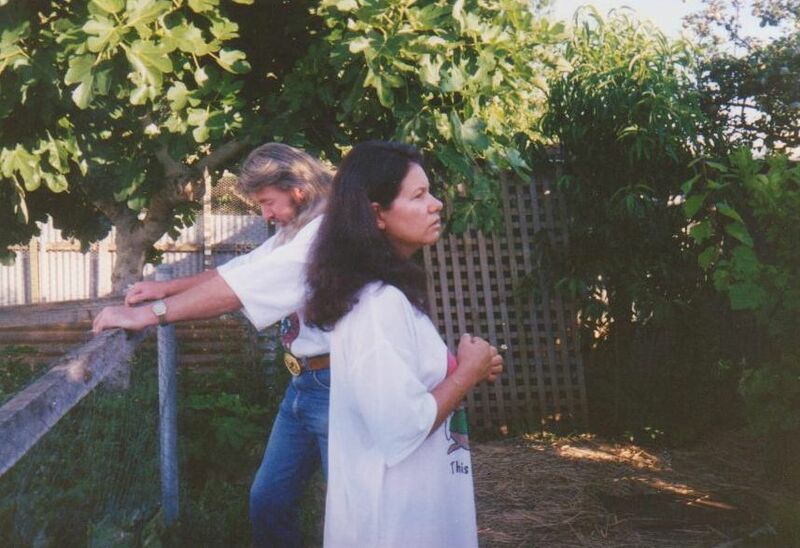 looking at the fruit trees section that was behind the owner's shed/garage.The huge tree on the right is an old nectarine tree, to the left of that, that smaller tree was peaches and a bit further along, the even smaller tree was also peaches. A bit further back and behind those was a big old apricot tree. The greenery running the whole length behind the trees was grape vines. The bare patch front left was newly planted with several hundred carrot seeds. As they grew we thinned them by pulling out baby carrots leaving room for the rest to mature. The green stuff, front centre is mint in several varieties, already there when we moved in. the veggie gardens, mostly not planted at this stage, behind the carrot/mint sections, behind the uncut lawn. The soil in this entire yard was so rich ad easy to work. 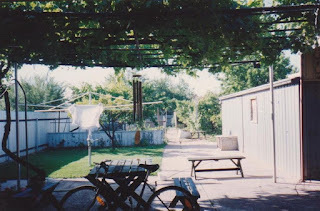 The bushy green in the far right corner of the veggie patch was a zucchini plant which grew so much zucchini I was passing baskets of it to family members and taking bucketfuls to work as well. The low greenery front left was bush beans, with weekly harvests enough to feed all of us and freeze some. All those tall stakes had baby tomato plants interspersed with capsicums (bell peppers) and way down the back you can see onions about to flower. Those onions were there when we moved in. Here is J setting up his basketball hoop, taking a break from spreading straw mulch. 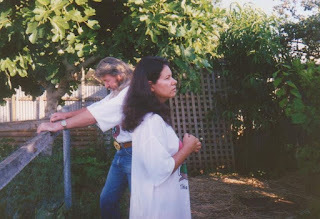 this is me and hubby, pretending to (be together) discuss the garden, at my mum's insistence, she wanted a photo. The dark hair is not my natural colour. I looked at the photos before I read the text and thought "Wow - that's a lot of wallpaper" even more 'wow' if knowing that is hand painted! So - you were always a gardener? I never had an interest in it for myself but I admire people who do it and are good at it. Grace; it isn't even wallpaper, that stuff was stencilled straight on to the walls. Not a true gardener, but I try, and if the soil is good and the yard is large enough, things work out well. Yes that house is a lot bigger than it looks in the first photo. Love this tale from your past. Granny Annie; those were good days and I still wish I didn't have to leave that fabulous garden. That's quite a little farm - and it looks to be right in town! Lovely place! I imagine you hated to leave it when the time came. 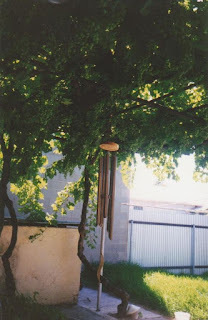 Sharon Qualls; it was very close to town, the suburb was close enough to walk into the city. 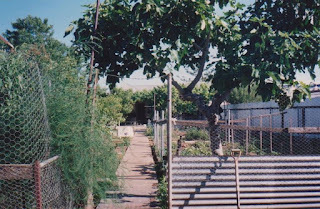 Most of the houses and yards there were established decades ago by Italian immigrants who all grew their own food and made wine from the grapes. I am over the top impressed by good dirt and asparagus. Also impressed, in a whole nother way by all the accommodation done, probably by all of you. The wallpaper, not so much. Thanks for the tour. Joanne; the asparagus was well established when we moved in, right beside the chicken run it would have got lots of manure and I suspect the rest of the garden did too. The walls weren't wallpaper, those leaves were stencilled straight onto the walls. Not by us, they were already there. I still miss that yard. Wow. 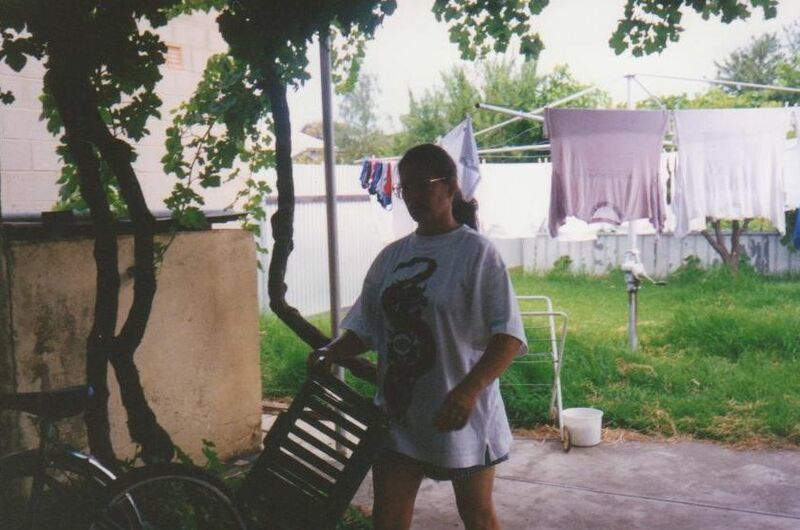 I remember a yard like that. Lots and lots and lots of fruit and vegies. 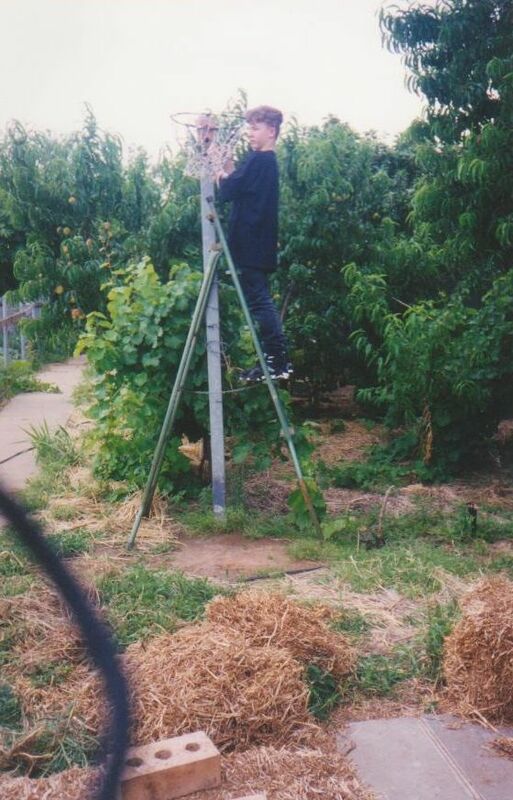 And growing up we had an apricot tree which was so prolific guests weren't 'allowed' to leave without a bucket of fruit. Loved this. Thank you. The stencilling would have got on my nerves after a whle though. 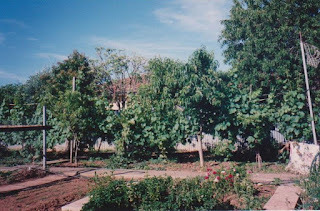 Elephant's Child; guests to that house usually left with bags of zucchini and tomatoes and grapes when they were ready. I had a freezer full of home grown and frozen fruit and veg. I learned to ignore the stencilling, but if I'd had the chance to buy that house, that would have been the first thing to go in renovations. Certainly a busy, people-filled time it was for you, River. One (and lots more) could certainly "live off the land" with a garden like that! Fancy hand stencilling the walls like that! Someone had a lot of patience, for sure! Much more than I've ever had. A lovely stroll, not only down the hallway, but down memory lane, too. Lee; we certainly lived off the land the whole time we were there, only a year though. Once hubby left, I couldn't afford the rent on my own. Probably I should have tried harder, we certainly didn't need to buy food. What a fascinating post. 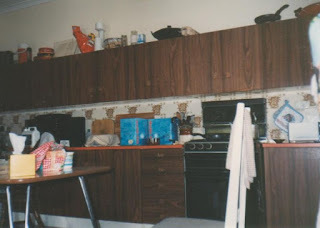 The stencil work is amazing, the kitchen cupboards horrible, and I remember them well from my childhood. It looks like a great family home. Mixed memories for you, I suppose. Andrew; mixed memories for sure, mostly happy. The cupboards were really terrible, nut the storage space they provided was great. I imagine it was home to one of those multi generational Italian families at one time. Oh, I loved wandering through your area. Those kitchen cabinets are what makes a lot of kitchens catch on fire....*cough*. The last photo broke my heart. The sadness is palpable, even over the internet. lotta joy; the cabinets were wood veneer, but in good condition, just awful to look at. We were all good cooks and careful with the stove, there was no danger of fire. Wasn't too long after that photo the hubby left. Nobody minded, we all knew the marriage had been over for a long time. Thank you for sharing this part of your life with us, I really enjoyed strolling through the memories with you, I am sorry they were not all happy but am glad that there was a little bit of happiness there. The stenciled walls was a lot of work, that had to take some time to complete. 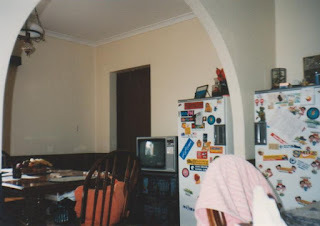 Jimmy; there was a lot of happiness, only one child was still in school, the others were working, a grandbaby on the way, and we didn't have to buy fruit and veg! Good times. I've often wondered who did all that stencilling and how long it took. peppylady (Dora); you're welcome. Coffee is on here too, with a slice of cake on the side. Thank you for sharing parts of your life with us. Stencilling was very popular at one time, but with anything fashions come and go, and décor is such a personal thing. I like the sound of your reply (above) to peppylady (Dora) ... coffee and cake, perfect for Sundays! It must have been hard for you to leave!! fishducky; yes, but the rent was high and hubby chipped in, then he left and I probably should have worked something out instead of just looking for a cheaper place. I had three kids working, maybe if we'd all put in a few $$$ we could have managed. Oh River what memories, and how interesting for you to show us all - thank you. 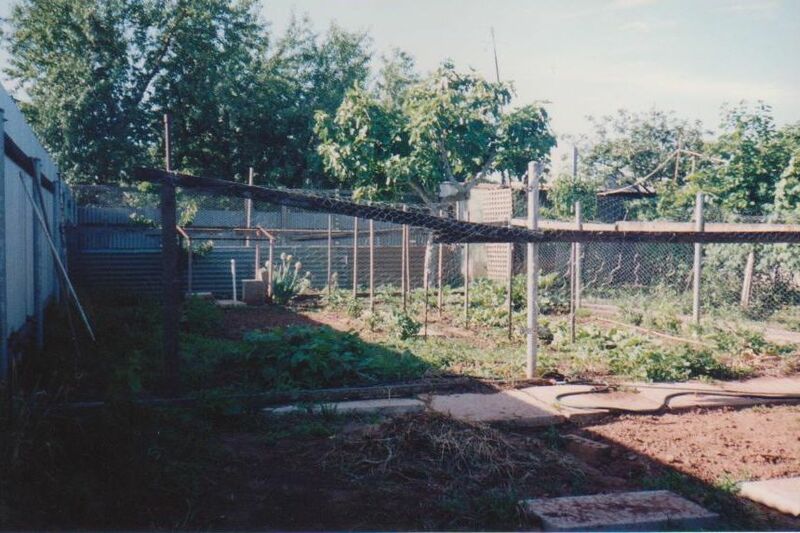 Remember the veggie gardens so well, parents had one, we did have one but all gone now. Margaret-whiteangel; they were good days. I lived within walking distance to my work, I had plenty of relax time, free fruit and veg. I'd been thinking of cleaning up the chicken run and getting a few hens. But fate had other ideas. River, that's not a house, it's a small country. No wonder you became a good cleaner. JahTeh; a small country, I like that description. But I was always a good cleaner before that, my previous homes were always clean enough to eat off the floors if you dropped something edible. Certainly far cleaner than my current tiny space, which is passable, but dusty. That is definitely NOT a small house! Such a great garden, too. Sorry it didn't work out for you to stay there longer. Heh, heh! My college roommates used to say that you could eat off OUR floor, too. But because there were enough dropped crumbs laying around, not because it was spotless. Val; ha ha, I suppose if you could get enough crumbs that would constitute a meal. Why not feeling like taking pictures? The Happy Whisk; there's been stuff going on here that's had me depressed, worried and sleeping a lot. It's getting sorted out, but taking far longer than I thought and it's really draining the energy. And at the moment it's far too hot to be wandering around the city with a camera. Sorry you had stuff making you sad. Here's to you not being depressed. I read your post about the heat. I'm that crazy cookie, you mentioned. PS: Was fun catching up on your blogs. 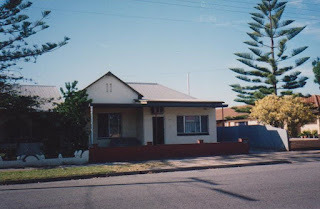 Happy Elf Christine; this is the home we lived in from 1993 to late 1994 and I often wish we were all still there. Of course the kids would have grown up and left, but there was enough room for all of them plus grandchildren to visit at once. But life goes on and things change and here I am in a flat that would fit entirely into that kitchen-dining space. Good memories. These remind me of the house we rented in upstate NY that was 200 years old. It had the same ornate kind of interior...but seriously hand stenciled? That's insane. Someone really loved that house. Crystal Collier; I think this house may have been over 100 years old or close to it, in spite of being mostly in good condition, there was one section that had caved in completely, one of the bedroom windows looked out onto it, so perhaps it was a closed in sunroom or patio. The house did have a well loved feel to it.